Includes Free Digital Download Code + Free CD Of The Entire Album! 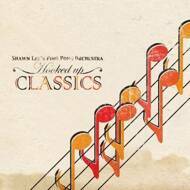 Shawn Lee dons his Ping Pong Orchestra hat for an album inspired by the Hooked On Classics series of the early 1980s. This popular series of albums (arranged by Louis Clark of Electric Light Orchestra fame) took well-known classical pieces and gave them a contemporary re-working, mostly adding a disco flavor. Lee throws his new musical twist on the idea, taking 12 favorite classical tracks and squeezing them through the Ping Pong Orchestra machine. While Lee has spent most of the year releasing and working on albums featuring vocal collaborations (the recent "Sing A Song" and upcoming "World of Funk"), this Ping Pong Orchestra album puts Lee back in library-record mode, creating cinematic instrumental music. "The 1812 Overture" is re-interpreted with a heavy dub re-rub, while "Swan Lake" and "Peter and the Wolf" receive a dose of squelchy moog-like bass-lines, and even "Dance of the Sugar Plum Fairy" and "Funeral March" is given a head-nodding backbeat. Lee left room for his own string-laden cover of "Also Sprach Zarathustra" (also recognizable as the 2001 Space Odyssey theme.) "These are some of the greatest themes and melodies ever written," says Lee. Mixing respect with cheek, and a need to funk-everything up, Lee covered tracks by Pyotr Ilyich Tchaikovsky, Richard Wagner, Erik Satie, Sergei Prokofiev, Richard Strauss, Nikolai Rimsky-Korsakov, Maurice Ravel, Edvard Grieg, Sergei Prokofiev, and Frederic Chopin. From big string sounds, horns, organ, dulcitone, clarinet, harmonica, melodica, bass melodian, orchestral percussion, harpsichords, flutes, sitars, guitars, and beyond, everything is played live, with no sampling. "What a pleasure to have such great material to work my musical mischief with, he adds. "I approached this project with equal amounts of respect and irreverence - this was essential to the concept." The end result is an album that will introduce new listeners to legendary pieces of music, and is set to turn the heads of classical music fans.